Administer prescribed medications, which may include acne products containing benzoyl peroxide (explain that these products initially cause skin redness and scaling but that the skin adjusts quickly); topical agents, such as vitamin A acid; and antibiotics such as tetracycline. Advise the client that heat, humidity, and perspiration exacerbate acne. Explain that uncleanliness, dietary indiscretions, menstrual cycle, and other myths are not responsible for acne. Explain that it will take 4 to 6 weeks of compliance with the treatment regimen to obtain results. Instruct the client to wash his face gently (do not scrub) with mild soap twice daily. Instruct the client not to squeeze blackheads, not to prop hands on or rub the face, to wash hair daily and keep it off the face, and to use cosmetics cautiously because some may exacerbate acne. nstruct the female client to inform her health care provider if she is possibly pregnant. Some medication, such as systemic retinoic acid, have teratogenic effects, therefore a pregnancy test is required prior to treatment and strict birth-control measures are use throughout pregnancy. Nursing Diagnosis: Impaired Skin Integrity related to the destruction of skin tissue characterized by papules, pustules, nodes and lesions. Encourage clients to avoid all forms of friction (touched, scratched by hand) on the skin. 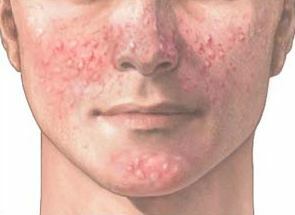 Rationale: Preventing the spread of bacteria that can worsen the infection in the skin lesions. Instruct the patient to be able to treat the skin with a clean and correct. Rationale: the right skin care reduces the risk of accumulation of dirt on the skin. Motivation of patients to keep taking the drugs and foods that contain enough nutrients. Rationale: To expedite the healing process. Observations of erythema and palpated for warmth around the area. Rationale: The warmth is a sign of infection. Rationale: To inhibit the growth of bacteria.